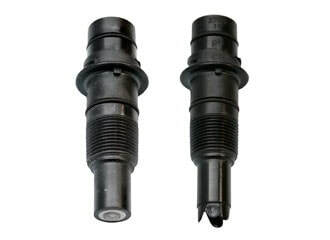 The Signet 2724-2726 pH/ORP Electrodes feature a patented reference electrode design and use the unique foul-proof patented DryLoc® connector. The large area PE reference junction and pathway are constructed to increase the total reference effectiveness and ensure long service life. The DryLoc® connector with foul-proof gold plated contacts readily connects the sensor to the mating 2760 preamplifier or the 2750 sensor electronics. The robust Ryton® threaded sensor body and choice of flat pH, bulb pH, or flat ORP sensing elements provides broad range of chemical compatibility for a wide variety of applications. There are two optional sensing versions available for HF and low conductivity. The quick temperature response is available in either a PT-1000 or 3KΩ temperature sensor and allows compatibility with all Signet pH/ORP instruments.